White ginseng is the root of the Panax plant that has been processed for therapeutic purposes. Ginseng has been used for thousands of years in China to promote good health. 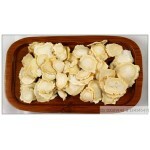 Today, white ginseng is one of the most popular herbal supplements. It may be brewed into a tea, eaten whole or taken in capsule form. 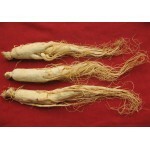 In its natural form, ginseng root is light tan in color. As it grows, the root forms appendages that resemble the arms and legs of a human figure. 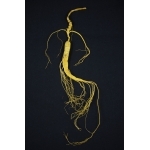 When it is processed for therapeutic purposes, the root is peeled and dried in the sun, which bleaches it white. This gives white ginseng its name. It differs from steam-processed ginseng, which turns dark red. Potential side effects of white ginseng are increased blood pressure, low blood sugar and intestinal disturbances. Much like coffee, white ginseng is a stimulant, which may cause nervousness and insomnia. It should therefore be used with caution under the supervision of a reliable health care provider. 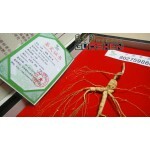 Ginseng has been used in traditional Chinese medicine since ancient times. Today, the active ingredients in ginseng have been identified as ginsenosides. In Western medicine, these phytochemicals are being studied as a possible treatment for cancer and immune system disorders, as well as for the treatments of human immunodeficiency virus (HIV) and Acquired Immune Deficiency Syndrome (AIDS). They are also being tested for the treatment of male erectile dysfunction and as anti-inflammatory agents.